The slashing crew are working on both sides of the Daintree River. They should finish north of the river today and will start spraying weeds at the southern end of the shire and head north. The patching team will continue to fill the hundreds of potholes that formed after recent rains. Drilling contractor is completing test drilling so the design can be completed on the Ponzo Rd land slip (see below). A crew is working north of the river with two backhoes clearing trees and cleaning culverts on Cape Tribulation Rd as well as side roads. Wherever possible, they are also filling ruts and potholes, however, this is very difficult with continued rainfall. A crew is completing the footpath in front of the Mossman Hospital and pit repairs in Pringle St.
Our paving contractor is completing priority repairs to footpaths in Mossman and Port Douglas. 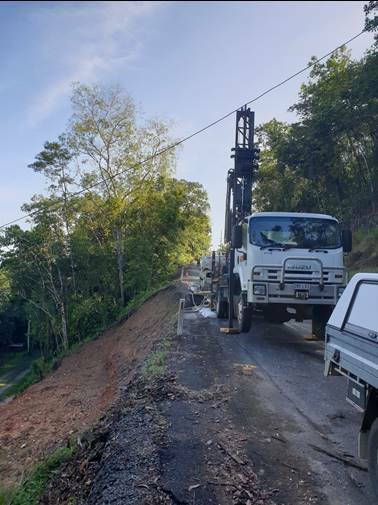 A team is working in the Daintree area to make roads safe. The Upper Daintree road is in very poor condition, however, we can not do too much until the road dries out. This area was flooded again last week and a lot of the hard work the crews completed was lost. The pipe pressure cleaning contractor should be back this week to complete work on Atoll Cl, Davidson St, Owen St and many other drainage systems around our shire.